A couple days ago, we launched the second installment of our digital dialogue series called #OpportunityRedefined, which seeks to lift up amazing leaders and ideas, provoke conversation, and incite boldness in addressing the toughest challenges we face in America. 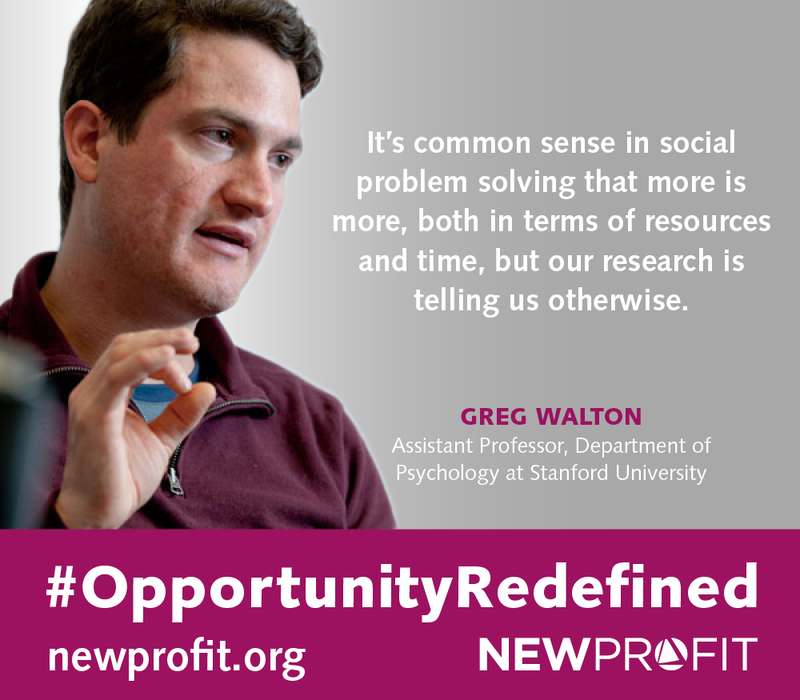 We’re excited today to publish our first interview of the second installment of our #OpportunityRedefined series featuring Associate Professor at Stanford University Greg Walton, who is committed to identifying psychological processes that contribute to social problems and to developing theory-based interventions to affect these processes. At a high level, what motivates me is trying to find ways to remedy the reproduction of inequality in society as a function of social class and racial-ethnic minority status. One context where that is important is the transition to college, where you see achievement gaps in GPA and persistence/completion for many low-income, minority, and first-generation college students. Even when these students come into college prepared and capable, they can run into big barriers to success and they leave at higher rates. Understanding why that is and how to help students overcome those barriers is what’s really important. These students become the new middle class and drivers of our economy and upward mobility. Most of my work focuses on what students believe about education and themselves – and how those beliefs affect their achievement. One area that we’ve researched extensively is students’ perception of belonging in school. When students enter a college where their group is under-represented, where people like them are negatively stereotyped, they can easily wonder whether people like them belong there. That changes how they perceive the social environment, what possibilities they see for themselves, and their behavior. When you’re thinking about how people like you might not belong in college, then even common challenges like feeling lonely or awkward interactions with professors can seem like proof that you don’t belong. That makes students feel more lonely, and hold back from making friends and connecting with professors. The result is a cycle in which students aren’t able to develop the kinds of relationships and networks that are essential to success in a post-secondary environment. Yet importantly, we can intervene in this system. In a variety of trials, my colleagues Geoff Cohen, Christine Logel, David Yeager, Mary Murphy and I have shown that we can share stories with students about how these worries about belonging are a normal part of coming to college, and it gets better with time. That helps students stay engaged, even when it’s hard. Ultimately, that can help reduce inequality. A second area of focus is studying school discipline, with middle school as our test case. This is work with my colleagues Jennifer Eberhardt and Jason Okonofua. Sometimes people say that students just lack control or that simple bias on the part of teachers is responsible for big racial disparities in student discipline. What we’re looking into and understanding is that students and teachers are embroiled in a deeper relationship that evolves over time. Both sides are aware of negative stereotypes, particularly about minority kids as troublemakers. That stereotype can lead teachers to take a punitive response to misbehaving minority students. And for students, it means that when they experience punitive disciplinary response from a teacher, they can worry that they are marked as a troublemaker. Together, this is a toxic cycle. We have to understand teachers and students together, and by doing so, we can potentially intervene with either to change their mindsets about interactions and have lasting benefits. We’ve done interventions on both sides. In one, Jason Okonofua, Dave Paunesku, and I created an online module for teachers that included articles about discipline and stories from students and teachers describing an empathic approach to discipline—emphasizing listening to and understanding students, why they misbehave, and prioritizing building strong relationships even as you discipline students. That reduced student suspension rates by half over the academic year. It’s common sense in social problem solving that more is more, both in terms of resources and time. Practically, that means we expect you’ll get a little for a little and a lot for a lot. That’s true in a context like learning math, where learning is done over a long period of time, but not always with complex social problems. One of the high level lessons of our work is that sometimes, the problem is not that people lack a skill they need to develop, but rather that they hold a belief system that leads them to make sense of school in negative ways, ways that ultimately undermine their outcomes. When that is the case, we can intervene with something as simple as a storytelling video or video series. For example, if we have shared with a student our material on how many kids experience challenges in college and overcome them, that can change their beliefs about college and, then, rather than letting a problem convince them they don’t belong and setting off the chain of negative social-psychological events, they can see the problem as a normal part of the transition and be resilient. We had a freshman student in our of our projects who commuted with her brother to a regional university. Sometimes she was on campus while her brother was in class and I asked her what she did. She said that she sat in her car and looked out at all the students walking around and thought, “How did they get to know each other? How did they become friends?” It was so sad. Here she was, a first-year college student, at a time in life when people are trying to meet and build important relationship, who was so fearful that she stayed in the car. We worked with an international student at a liberal arts college. She told us how she felt up-in-the-air, disconnected. She felt that way in college. And she felt that way back home, where she couldn’t fully connect with her peers who were having different experiences. It’s easy for people going to college to feel like they are the only ones going through the challenges facing them. In reality, there is a general truth that this is a major transition for everyone. If we can help students anticipate this challenge, help them see how normal it is, we can help them make it through. From a practical standpoint, how do you see these insights being developed further and deployed? We just completed the first cycle of work with our College Transition Collaborative (CTC), a project with college and university partners to develop, deliver, and evaluate pre-matriculation versions of social-belonging interventions with incoming students at campuses across the country. We’re testing our interventions on a randomized basis with students at 18 schools. We’ll be expanding again to 25 schools soon. What we’re trying to do is to learn how we can work with heterogeneous post-secondary institutions, from highly selective schools to broad access universities, to effectively deliver these interventions in diverse communities. We’ll know a lot more about how to work together with partners, how to deploy these interventions, and what their effects are over the next few years. What keeps you optimistic and excited about the future in your work? A few years ago, the Thaler and Sunstein book Nudge: Improving Decisions About Health, Wealth, and Happiness came out and had a big impact. It highlighted that big problems, like poor signup rates for organ donations or retirement savings plans, can be addressed if we change the situation even slightly to make it easier or more convenient to behave in a positive way. This approach doesn’t control the situation just tweaks it to encourage positive change. But a limitation of the nudge approach is that all it does is affect the person’s behavior in that given circumstance—it just nudges a given behavior, or decision. But many problems unfold over time in many complex circumstances. The problem of school achievement isn’t a problem of one decision or behavior in one situation. It’s more complex. What people carry with them from one circumstance to the next—what can affect their behavior in diverse situations over time—are their beliefs and theories, how they make sense of the world. In understanding these psychological processes, we can create “wise” interventions that help people function more effectively and achieve their goals and, at the same time, address major societal problems.